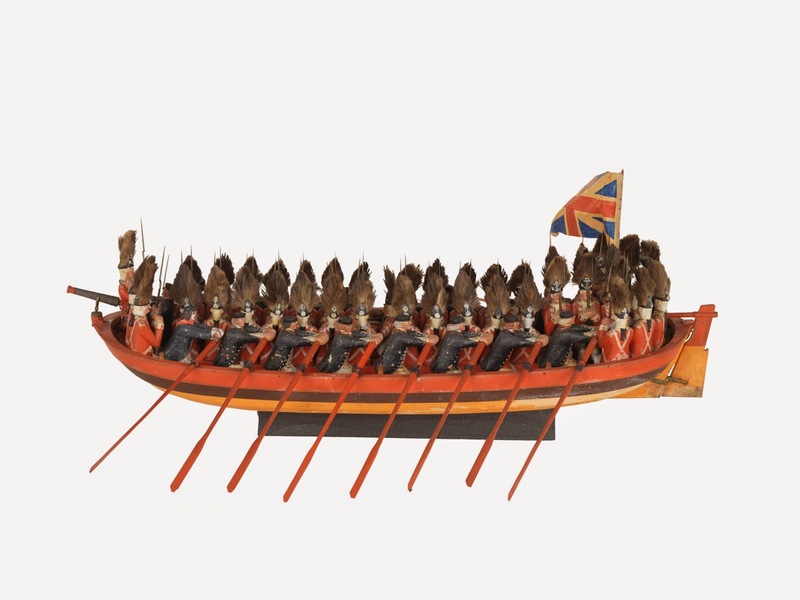 "Passenger Vessel; Landing Craft," maker unknown, c. 1758, National Maritime Museum. The particular date on this model is somewhat questionable. This type of vessel certainly was used in the late 1750's and into the early 1760's, but there is no indication that they were abandoned shortly thereafter. The marine grenadier uniforms contribute to my doubt. The marines are clearly wearing bearskin caps. The symbol you see on the back there is a smoking grenade, indicating that these are indeed grenadiers. British marine grenadiers are rarely depicted in art, which makes this piece interesting. 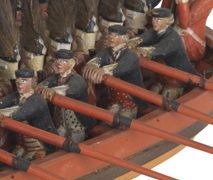 The reason this contributes to my doubt is that marine grenadiers of the mid-eighteenth century are depicted wearing cloth mitre caps, rather than the bearskin seen here. 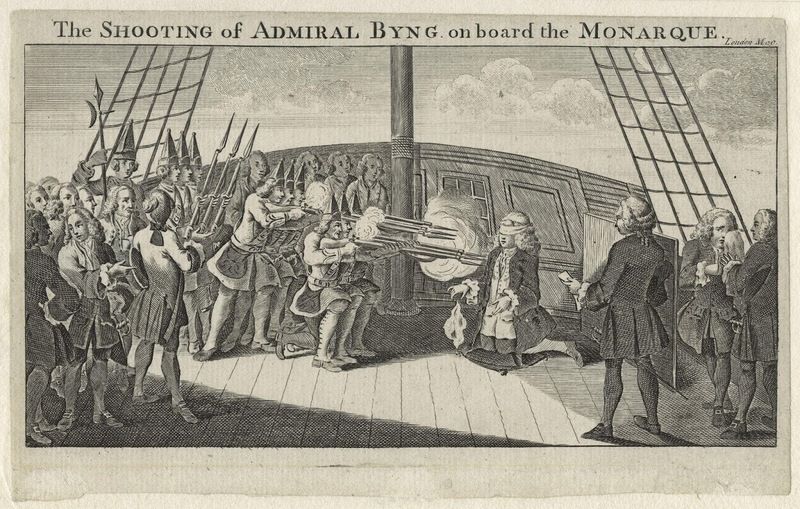 This example, The Shooting of Admiral Byng on board the Monarque, by an unknown artist in 1757, shows marine grenadiers wearing those cloth caps. The Royal Clothing Warrant of 1768 stipulated that the British army would equip its grenadiers with "black bear-skin" caps, as their highland grenadiers had done since the Royal Clothing Warrant of 1751. Granted, the Royal Clothing Warrant did not regulate the clothing of the marines, who were under the Admiralty, but the influence of the Clothing Warrant on the marine uniform is self evident. Though I cannot be sure, I would venture to say that this model, based solely on the uniforms of the marines, is late 1760's at the earliest. If you can offer any insight on Marine uniforms and the possible date of this piece, please comment below. Of course, it still falls within our examination regardless of the precise decade. And we're not here to look at redcoats, we're here to look at bluejackets! The sailors all wear the same short blue jacket with open mariner's or slash cuffs. Though not all of them appear to have waist pockets, the fellow furthest aft here (on the far left) does. Their caps are small, and quite similar to those worn by other seamen working barges and oars. There does not appear to be a metal badge on their caps, perhaps indicating that none was worn when they were transporting soldiers, rather than specific officers. Their waistcoats are a surprising variety of colors! Stripes and spots decorate the lot of them, in white, blue, and red. EDIT: It has been brought to my attention that the British Marines weren't called "Royal Marines" until 1802. I've edited the piece to reflect that.